There are tons of yoga studios in and around Philadephia. If you’re new to your neighborhood, new to a yoga practice, or just want to explore a new studio in your area, you’re in luck. We compiled a list of 51 studios (YUP, 5-1) to check out in the Philly region. From Center City to the Main Line to South Jersey and everywhere in between, there’s a studio out there for you. Keep this page bookmarked so you can always find the studio nearest to you. This Center City-based yoga studio focuses on building strong bodies and minds. In addition to yoga classes, they’ve got a packed schedule of mindfulness meditation sessions so you can strengthen your mind alongside your body. While this price may be steep in comparison to other studios in Philly, the workout is like no other. CorePower offers nine (yes, nine) different class styles that range from beginner, non-heated yoga to high intensity heated yoga. Maha Yoga and Healing Arts provide a slew of class options for their clients to find the flow that works best for them. They even offer a flow for people living with Parkinson’s disease and/or their caregivers as well as a flow for veterans and active service members. No matter what may be happening in your personal life, Maha Yoga helps you leave it all on the mat. This studio focuses on making your yoga practice apart of your everyday life. There are also locations in Fairmount and South Philly. In this heated studio, you can learn the basics — or get out of your comfort zone — with their yoga and Pilates fusion class. If your goal is to improve your flow, this is the place for you as focusing on holding the pose is as important as the pose itself. This studio bills itself as Philly’s first all-donation yoga collective. Instead on focusing on bringing in the big bucks, the collective focuses on making yoga inclusive for everyone regardless of the circumstances. If you prefer a chiller vibe, this is the place for you. No, you aren’t seeing double. Hot Yoga Philadelphia shares their studio space with their partner program Philly Yoga Factory (see above). Since 2001, they have been teaching Philadelphians about the ancient art of yoga and have since expanded their practice to offer more services than before. Need yoga to focus on your health and healing? That is the main focus for the instructors at Shanti Yoga and Ayurveda. If your goal is to expand your horizons beyond the comforts of the vinyasa flow, there are other practices to choose from as well. At this studio — which, yes, also offers barre — the purpose of the practice is to focus is on you. Here you can finally get the attention you need on each of your poses. End your hectic workday by being present on the mat. This studio promises a good sweat through their heated sessions. There are also two other locations: one in Westmont, New Jersey and another in Avalon, New Jersey. Unlike the name suggests, Mama’s Wellness Joint isn’t just for new or expectating mothers, although they get a lot of attention here. Founder, Paige Chapman, is a Philly-born yoga instructor and Doula who puts her focus on healing. There are a ton of classes and workshops that focus on the relationship between mother and child as well as the beauty of feminine energy. The Yoga Garden hopes you find your vibe and tribe practicing alongside their instructors. Choose from over 100 classes a week in a range of style both at their Philadelphia location and their Main Line (Narberth) location. Ashtanga Yoga focuses on simple discipline of movement and breath. Instead of thinking of all the things you have to do once you leave class, this class allows you to stay present in the current moment. Who said yoga exclusively had to be on a mat? At Kaya Aerial Yoga, silk ribbons keep you afloat as you do yoga with an aerial view. While most of the positions typically take place on the mat, they can be done in the air as well. If you need a place to practice where the instructors have a full understanding of the human body, look no further. Besides yoga, they offer an array of services such as massages, Reiki healing, and Ayurvedic holistic health. Their understanding of how the body moves translates into their yoga practice as well. In this 90-degree heated room, you’ll learn what you’re made of. Sometimes, it’s hard enough to nail certain poses in normal temperatures let alone with added humidity. To save some dough, keep an eye out on their schedule for their $5 community flow. From all-levels Vitality Flow classes to prenatal yoga to candlelit yoga, this studio offers a style for everyone. There are two other locations in Rittenhouse and South Philly. The sense of community is strong at this practice as two best friends founded this studio. At Priya, they want you to focus on the art of letting go and being present. Studio1831 offers Hatha Yoga, with a focus on increased flexibility, enhanced concentration, and a developed sense of strength, balance, and coordination. Ever taken a yoga class called ‘Sculpt Jawn’? Thought not. You can try this twist on yoga sculpt at Lumos Yoga & Barre, or try a class where you can do yoga in a chair if being on the floor isn’t for you. If you’re looking for a studio that emphasizes inclusivity, this one is for you. To foster your growth and love for the practice, The Yoga and Movement Sanctuary focuses on community as well as diverse and holistic ways to practice. This studio’s signature class, Architectural Movement, is informed by other “perspectives on human movement” outside of yoga and emphasizes geometric alignment, as well as mobility and strength. Roots Philly Yoga takes the idea of having “roots” literally. This studio was born of the idea that a group of people practicing together could essentially shape the neighborhood. If you want a space that focuses on cooperation, collaboration and community, you’ll find it here. Three words: Happy. Hour. Yoga. I mean if that isn’t enticing enough, they also offer Yoga Sculpt, which uses gentle and effective techniques to focus on upper body strength. This stunning Fishtown studio offers classes across all levels of expertise. Plus, they’ve been known to host puppy yoga — a must-try for any yogi or dog lover. This yoga studio offers over 10 different styles of classes — including a West African Dance class (with live drumming). This Baptiste-affiliated studio, encourages you to “come as your are, not as you think you should be.” At Grace and Glory, they want you to discover, explore, and expand. Check out this space to step out of your comfort zone. If you need a place to practice that’s laid back, welcoming, and affordable — look no further. This non-profit studio brings affordable yoga, meditation, and healthy life style programs to people in the area. If you need an intermission from the day-to-day, stop by this studio to challenge your inner power on and off your mat. The values here are simple: create a safe space for everyone, disconnect with the world and reconnect with yourself, and build a stronger community for the people around you. Yoga on Main wants you to drop in and unleash your inner fire. They offer Hatha and Kundalini Yoga as well as a slew of other classes and workshops. This yoga and barre studio focuses on combining the two activities to get you fit. Their holistic approach to fitness through fostering the mind-body connection will have you leaving in better spirits than you came in. Can’t make it to a class? Try one of their online videos in their virtual studio. This studio got its start in Abington back in 2013 and has been serving the community at-large ever since. Founder Tara Roulis is dedicated to the growing body of yogis in the area. Their classes range from Beginner Yoga to Yoga for Kids. A yoga studio that sells clothes as well as beverages and snacks? Yes, that’s Rebel. While this studio offers a bunch of different classes, they also keep their hands busy by selling apparel (brands such as ALO, Beyond Yoga, Teeki, and more), beverages, and locally sourced organic snacks. They’ve got it all. The yoga community in Mt. Airy has grown tremendously in recent years and this studio is one of the reasons why. Blue Banyan Yoga gives people in the community the space to further their practice while not traveling too far from home. The director of this studio has been teaching for over 20 years and uses her ample experience to the benefit of her students. Magu is located in Mt. Airy and offers a bunch of different classes to get you moving and feeling stronger than before. Studio 34 focuses on creating flows for all. Most notably, their Queer and Trans Yoga and Yoga for Recovery classes highlight the struggles of people who can often go overlooked. Always heard about Bikram but never experienced it for yourself? Well, look no further. This state-of-the-art-facility is both spacious and clean (with three showers in both the men and women’s bathroom) and has a hot room that’s over 1500 square feet. There’s definitely room to maximize your savasana! Have you ever wondered what it’s like to be trained by someone who’s trained Olympic athletes? Well look no further! Owner, Callie has taught the best of the best and now uses her experience to promote self-love through yoga. Plus, they’ve been known to host fun pop-up events, like pig yoga. There’s a second location in South Philly. This yoga studio doubles as a wellness boutique. That means after finishing your vinyasa, you can purchase all sorts of healing mists and bath salts for same take-home self-care. Score! When it comes to yoga studios in Philly, Three Queens is possibly one of the most recognizable names. In this studio, perfecting your alignment and moves takes high priority. 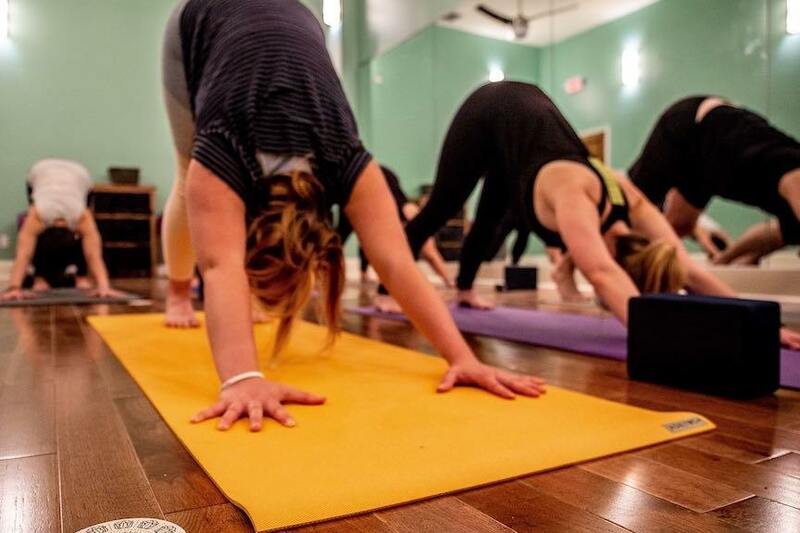 From vinyasa yoga to yin yoga to core yoga to pig yoga, there’s a little something for everyone here, no matter if you’re a serious pro or just someone looking to experience a yoga flow for the first time. There’s a second location in West Philly. This studio focuses on making your yoga practice apart of your everyday life. There are also locations conveniently placed in Fairmount and Rittenhouse. Practice makes perfect from what we’ve been told. Why not start your yoga journey at a place that focuses on giving personal attention? While this studio isn’t deep in South Philly, it’s still close enough to consider. Another Baptiste Power yoga affiliate, this studio will boost your capabilities while you sweat (really, sweat) during any one of their classes. Here, the owners want you to view their studio as a place of refuge. As you go through your journey of self-discovery, they hope to be there, guiding you along the way. Plus, there is tons of free parking. Yoga? Massage? There couldn’t possibly be a better duo! They go beyond just using yoga as a practice as they incorporate techniques to guide you through your every day life. Verge yoga offers different classes that help you customize your flow so you can get the best from your experience. They also have a mobile app which makes signing up for classes a breeze. If you’re an all-access member at this studio, you get unlimited babysitting in Studio K. If that isn’t enticing enough, they offer a bunch of other specialty programming in addition to their regular classes. The art of movement is celebrated here. At Blue Deer Yoga, they believe movement is “the food that nourishes the deepest aspects of your heart, body, and spirit.” There’s no better time than the present to get moving. Mats Offered: Yes, class includes mat rental. This Baptiste Power Yoga affiliate focuses on the heart and the grit — a.k.a. perseverance towards a goal — of its members. If you’re looking for a sense of community in the South Jersey area, look no further. Additional reporting by Michaela Althouse.